If living with a deep awareness of God in our lives is important, how do we do it without moving to a monastery? How do we discern and respond to God amidst the places, routines, and relationships of our everyday lives? In this book, we go in search of God’s presence in homes and neighborhoods, supermarkets and sporting arenas, workplaces and weekends. Along the way we look for practices that can lead us more deeply into the way of Jesus: activities like cooking and laundry, walking and sleeping, shopping and conversation with friends. Throughout, we want to better understand how to make God a central part of our lives, and to hear Jesus’ call to “follow me” more clearly in the world around us. Simon Carey Holt is pastor of Collins Street Baptist Church, Melbourne, and adjunct lecturer in practical theology at Whitley College, University of Divinity. He is author of the award winning God Next Door: Spirituality and Mission in the Neighborhood (2007), and Eating Heaven: Spirituality at the Table (2013). Simon Carey Holt hallows the everyday, revealing God’s presence in our homes and neighborhoods, in pubs and offices and sports stadiums, and supplying us with wisdom and practices for sensing God when we wake, when we sleep, when we eat, when we play, and when we work. For every person seeking to move beyond a Sunday faith, for every busy worker and parent for whom spirituality feels out-of-reach, Simon Carey Holt is an invaluable guide. Drawing from Christian tradition and personal story, he points to God’s presence in the smallest routines, and explores how we might honor the sacred in ordinary things. Heaven All Around Us will bust your ideas of spirituality wide open. 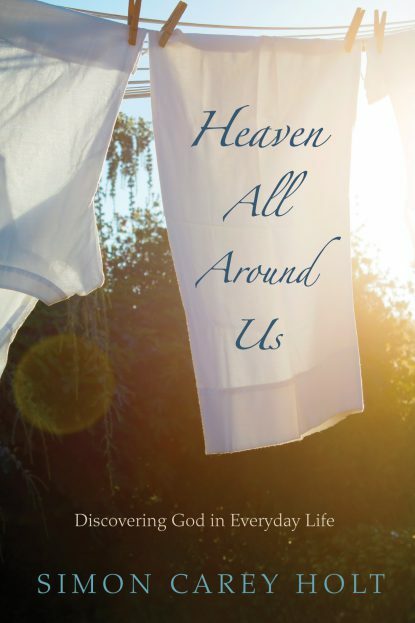 It is a must read for everyone who has ever thought, ‘I’m just not that spiritual.’ Holt will make you think again as he peels back the surface of ordinary things to expose the thrill of God’s presence everywhere. This is a book that will enlarge your soul. At the same time as our dislocated and dispirited society is looking to find connection in the near and the neighborhood, so this book invites us to find God in the ‘local’ of our lives. The author enticingly encourages us to experiment with seeing matters as routine as the laundry, the making of a meal, sports, and everyday conversation as ways to nurture our spirituality. It will be freeing and stretching for many who want to grow in love and goodness. Simon Carey Holt has been at this for a very long time. From the start, his eyes have been shaped by the local and his life has been lived in the everyday. In this scurrying around for new fixes for the churches I urge you to sit quietly in your own place of living and absorb the practices Simon is proposing.